Knowing the time is a daily requirement of everyone, the individual as well as the community. 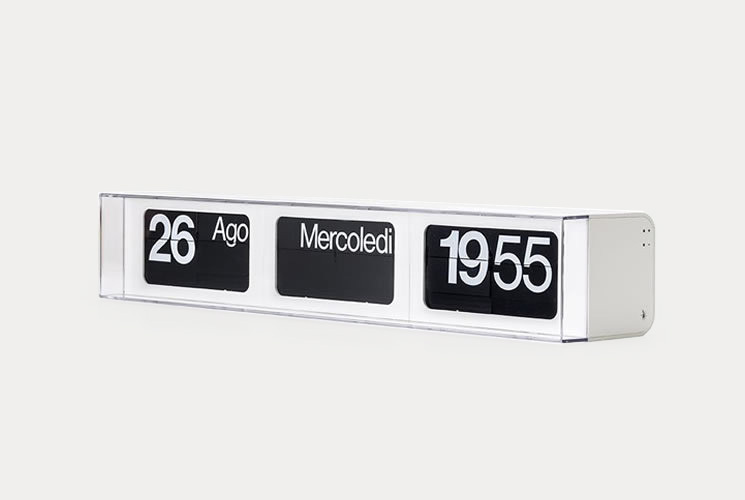 Displaying the time is the raison d'être of the Solari flip clock. 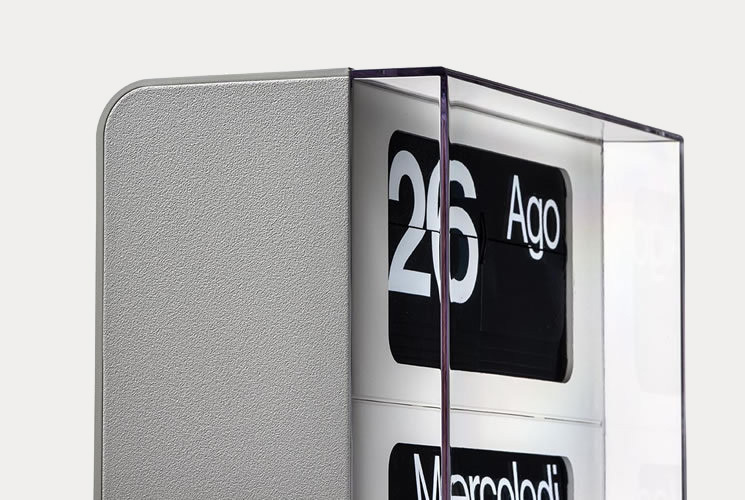 Dator was created to give something more to the reading of time, the hour and the minute: it was the evolution of the flip clock that makes it possible to view with one glance the day of the week and date. It is therefore a clock and perpetual calendar; in fact it automatically signals February 29 and leap years. Minimal design, clean lines, and rigorous black and white: in Dator 60 everything is designed to ensure better visibility, even from a distance. Even with low light or without direct illumination, the silk-screened white letters on black and their particular size provide a high level of readability in every space. This is why Dator 60 is perfect for the home, office and contract spaces... and all those places to which you want to give something unique and personal. It is the distinctive object, iconic –instantly recognizable as a design element that enriches and beautifies the places where people live, work, share experiences and emotions. 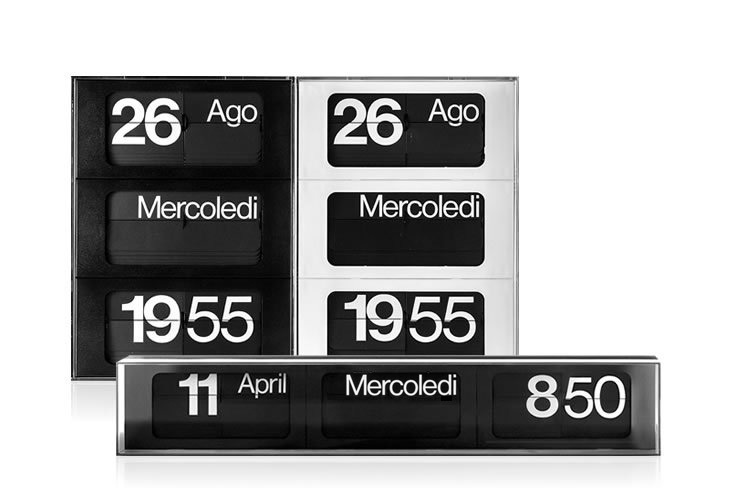 In white or black, it is available in two variants: horizontal, in which the data appears on the same line, or vertical with (from the top down), the date, day of week and time. Solari Udine's language, culture and tradition are Italian. Quick start guide for the programming of the Dator 60 models (both vertical and horizontal). For more detailed infos, refer to the Manual, available to download at the bottom of the page. Quick start guide for the programming of the Dator 60, Special Edition for MoMA. Essential procedure before programming, for the horizontal model of Dator 60 by Solari lineadesign. Important / make sure to remove the pins from both the sides, before programming the clock. Essential procedure before programming, for the vertical model of Dator 60 by Solari lineadesign. Important / make sure to remove the three pins, before programming the clock. How to correctly slide the battery contact, for the two models of Dator 60 by Solari lineadesign. Important / identify the correct slot for the sliding battery contact. Essential procedure before replacing the batteries, for the two models of Dator 60 by Solari lineadesign. Important / make sure that the residual energy inside the CPU is exhausted, pressing the "+" or "-" button until the sound signal stops.